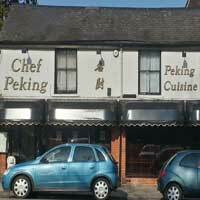 " it won’t be long before our return"
"The food was delicious as always"
Always enjoy a visit to the Chef Peking, never had any problems with food or service, in fact service has always been fantastic as has the food. I would highly recommend a visit, make sure to get the dumplings if you do. We have been to this town centre restaurant twice now in 6 weeks for their Sunday buffet and have to say it won’t be long before our return. The buffet was generous in its large choice of dishes. This is clearly a popular place to eat for a Sunday lunchtime as for the second time the place was packed. Lunch was served from 12 noon to 2pm. The buffet cost £12 per head with a small coke priced at £2. Total price for the three of us was £42 plus tip. I don’t think the food could get much better than this though at £12 a head I thought the buffet was a little over priced but then we are talking about Harpenden. We ate her on New Years evening, myself partner and 5 year old daughter. The staff were extremely friendly and welcoming and gave very good advice about quantities, spiciness and what would be suitable for my daughter. The food was excellent. We had the usual crispy duck but also satay and ribs - the satay sauce was the best ever......I will definitely return here next time I am in the area - I never consider myself a fan of Chinese food probably because I have never had a meal like this one before. Great and tasty food! Staff very friendly and funny, kept making jokes all evening! Good value for money as well. Can't wait to go back soon! Went with my daughter, son in law and new baby for Sunday Lunch - Eat as much as you like. Usually the a la carte menu is quite expensive but is always worth it as you get brilliant food. The Sunday Buffet is £12 per person + drinks, which makes this very economical. You don't have to wait for servings, you just go up and pick what you like. My favourite starter is always seawead, and I had seconds of that. Then I had picks of lots of other dishes - twice again. Plenty of prawn crackers to take to the table too. Then the afters. You can have just as many afters as befores. I was too full to have seconds of afters. The food was delicious as always, but did get cold on the plate quite quickly if you are not a fast eater. My daughter does not eat pork so the waitress got her sweet and sour chicken instead at no extra charge. The staff are very quick to help you. We all had a great time and remained feeling full until well into the evening when only a small snack supper was needed. LOVELY. Just been for an excellent meal yet again at the best Chinese restaurant, service is always friendly and efficient can't fault it. Food as always is superb definitely can't complain and whoever has complained on here must be getting confused with somewhere else. I would definitely recommend a trip there to anyone! !